The ukulele is a fun and fairly easy instrument to play. Originating from Hawaii, since it was first made in the 19th century, it quickly became much more than a traditional instrument. Nowadays, many famous musicians choose to integrate the uke in their songs. This instrument has also become a popular choice for people getting into music, as it’s a pretty easy instrument to get a hold of. As with guitars, you will need new strings for your uke from time to time. However, finding the right ones can be hard, especially with all the different types on the market. What strings are on a ukulele? What are the best uke strings? That’s why we’ve decided to help you with choosing the right ones. Sit back, relax, as we step into the world of the best strings for ukulele you can buy! What are ukulele strings made of? Before we start talking about different types of strings, it’s important to note that varying ukulele types require different strings. As every uke type has a different scale length, the main difference between string types is just that – the length. Soprano (Standard) – This is the most common uke size. The body measures 21 inches, and the scale is 13 inches long. These ukes are tuned in GCEA or ADF#B. These offer a bright sound, so coupling them with suitable strings definitely have an impact on the sound they provide. It goes without saying that you should know exactly which of the mentioned uke types you have, in order to get the appropriate strings. Chances are that the strings your uke came with are nylon. Are all ukulele strings nylon? While it is the most common string type, there are a couple more different ones, varying in material of choice, to the method chosen for wounding them. When it comes to materials, there are a few options. Let’s take a look at this quick ukulele strings comparison. Gut strings were the first ones to appear alongside acoustic instruments. As the name suggests, they are made of the guts of different animals. Musicians prefer this material as it offers a more rich and complex sound than nylon or titanium. They also feel very different under the fingers, and tend to slide better. They tend to be pretty expensive. As you’ll see, companies like Aquila have managed to imitate the sound gut strings offer to a certain extent by treating the plastic in a special manner. 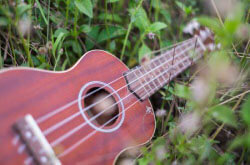 Nylon ukulele strings can be made from various types of different nylon polymers. This means that it’s not unusual for strings coming from various companies to sound a bit different. The cheapest nylon strings are made in a process called extrusion. A nylon filament is made by pushing molten nylon polymer through holes varying in size. By doing that, you get strings varying in thickness, which ultimately produce different tones. 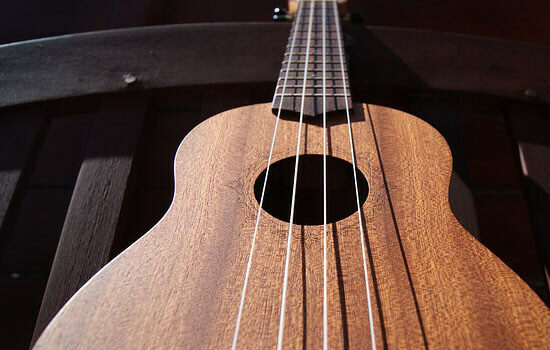 Good ukulele strings, and a bit more expensive ones, are also made by extruding the nylon polymer, but are then ground precisely in order to get a precise diameter. These strings also provide a bit more of a textured feel as well, which some musicians like, while others dislike. They won’t wear your fingers out as much as other types. The sound you get can be described as warm, while still being pretty clear and snappy. Nylon strings are affected by temperature shifts. This means that they will stretch and contract when exposed to warmer/ colder air. Have this in mind as your uke can get out of tune pretty easily if you take it outside, or even inside, like when you open your windows or turn on the AC. One more important thing you should note is that new strings need more time to settle down. Changing your strings before a show is a good idea as you will get a more clear and better sounding tone. However, give the strings some time to settle down and fully stretch, as they won’t stay in tune for long. Another easy way to get around this problem is to stretch them a bit more than the tuning you’re using. 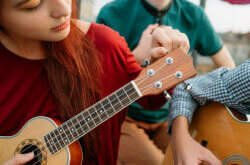 By doing this, you’re minimizing the possibility of your uke getting out of tune in the middle of your performance. 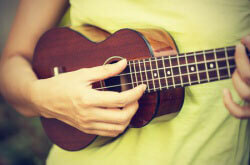 Fluorocarbon or plastic ukulele strings are an alternative to nylon ones, which many musicians prefer. The sound they produce is very similar to nylon ones, and they don’t stress out your fingers too much. The main advantage of fluorocarbon strings is that they tend to be less affected by temperature changes than nylon ones. So even if you accidentally buy longer strings, you can cut them to size with a pair of scissors. Just pay attention to the tuning they’re meant for. Titanium strings are much more durable than nylon or fluorocarbon ones. They are also monofilament strings, but as they are made of metal, they are less likely to snap under pressure. The sound these strings provide is a bit brighter and louder. If you’re looking for a way to get more volume and projection from your uke, these should do the job just fine. Steel ukulele strings are not that common for ukes as they are for acoustic guitars. The tension that’s applied on both the bridge and the body of the instrument when using this type of strings can lead to the uke being damaged. Steel strings are most commonly used in hybrid instruments, such as guitar/ukulele or banjoleles, so if you’re not really that familiar with your ukulele, it’s best not to use steel strings. Wound nylon strings consist of two parts. An inner core that is made of nylon is wrapped with a polymer-made winding material. This type of strings is usually used for baritone or tenor ukes, as the two lower strings. They provide a somewhat deeper sound, which is a personal preference. The only downside of wound nylon strings would be the squeaky sound your fingers make when fretting these strings. Wound metal ukulele strings have a metal core and winding material that surrounds it. These are primarily intended for larger ukes and when musicians need a boost in the lower end of the frequency range. Like wound nylon strings, these can also be a bit squeaky. Unlike nylon or fluorocarbon strings, cutting wound strings to the desired length can ruin them, as the wrapping material can start to unwrap. So, what are the best ukulele strings for me? Well, it depends. The main factor should be the sound you want your uke to have. Durability and overall performance can be more important than sound if you’re on a slightly tighter budget. As we’ve just mentioned, a baritone or tenor uke can sound much better with wound strings, as they provide that needed bass. The last and very important thing to have in mind when buying new ukulele strings is the tuning you plan to play in. We’ve already mentioned the different tuning the soprano, concert, tenor and baritone ukes use. The most common tuning is GCEA. However, a very important thing to note that there are two versions of this tuning. The first one is written as GCEA and is exactly that. The second one, however, is gCEA, which means that the G string is tuned 1 octave up. Double check with each string pack, as getting the wrong one without noticing can leave you with a broken string when setting your uke up. Alternate tuning or high tension sets have a story of their own and are used on special occasions. Your best bet would be to skip them for now if you are a beginner and don’t have much experience with this instrument. Now that we’ve covered the basic things you should know about ukulele strings, it’s time to go over some of the best ukulele strings on the market. Starting from the smallest uke size, let’s check out the best soprano ukulele strings on the market. 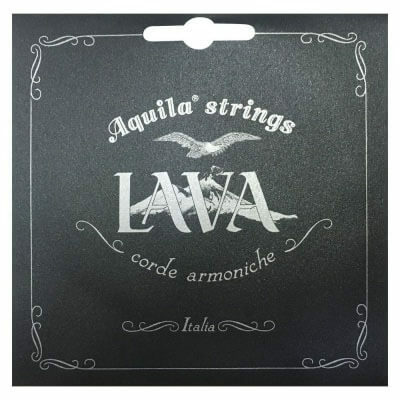 Aquila is a famous brand known for making very high-quality strings not just for ukes, but other instruments as well. The AQ-4 soprano strings offer a more clear sound than regular nylon or fluorocarbon strings, as they are made from nylgut, a special polymer which imitates the characteristics of old school gut strings. As they are very accurately manufactured and gauged, intonation is perfect and durability is on point. This is a high G set, and Aquila offers the AQ-5 as their low G alternative. If you’re looking for a pair of solid-sounding and durable strings, the AQ-4 is a great option to consider. 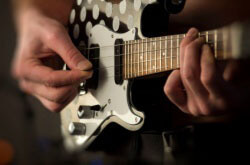 D’Addario is yet another famous company, and their products are widely used, especially amongst guitar players. The EJ87S Titanium uke strings are made in the U.S.A. and offer optimal performance and quality. These strings offer a modern, powerful, and projecting tone. 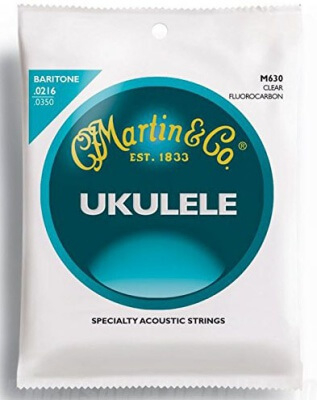 Many users found that these strings made their uke sound much better, especially when compared to stock strings most ukulele manufacturers include. 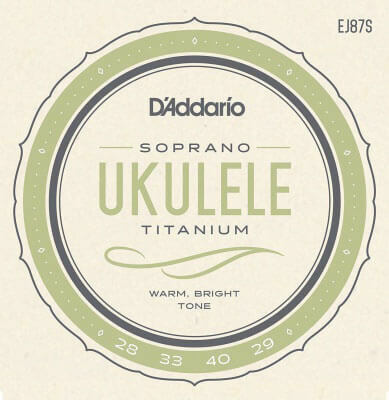 For around $5 you’ll be getting a much more balanced and crisp tone from your soprano uke. Who says you can’t have stylish yet good sounding ukulele strings? 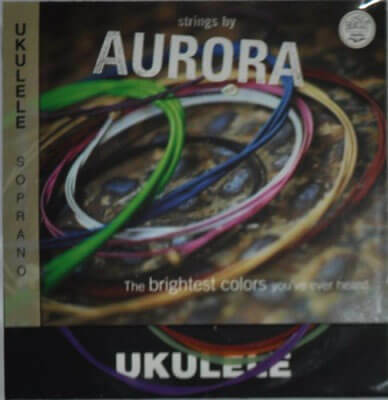 These multi-colored strings by Aquila offer not only bright colors to go alongside your uke, but extended durability as well. They also tend to stay in tune much longer than most competitor strings. These are the best soprano ukulele strings if you want to give your instrument a nice personal touch while maintaining solid sound and great durability. Moving on to the best concert ukulele strings, let’s see what fits your uke the best. 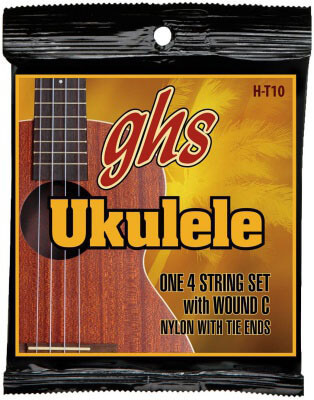 The GHS H-10 strings are a solid option for any concert ukulele. They deliver a punchy and balanced sound and feel very comfortable to play. As they are black, they will fit nicely if you also have black tuners, or simply like the added contrast on your instrument. 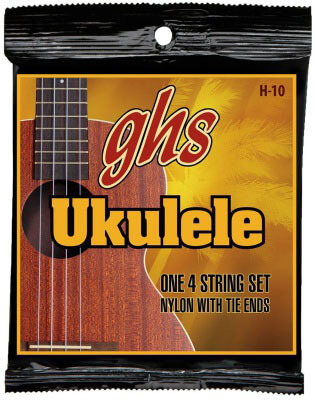 All things said, the GHS H-10 are a solid option when it comes to concert ukulele strings. They are durable, sound pretty good, and are relatively cheap. 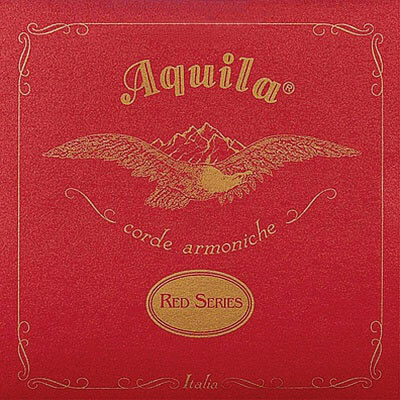 Aquila with their Red Series strings offers a more comfortable playing experience coupled with a greater volume. Enhanced intonation is achieved as all of the strings are similar in diameter, and differ in material density. These strings feel way more responsive across the fretboard and offer a unique environment for your skills to really shine through. If you’re a more advanced ukulele player, or simply want a significant improvement when it comes to strings for your concert uke, the AQ-86 are the best option. The M600 strings by Martin are a great solution for your concert uke if fluorocarbon strings are your thing. The manufacturing process used by Martin makes these strings perfect for precise tuning, as the higher tensile strength gives them the ability to hold tuning for extended periods of time. Designed to give you very clear, mellow and warm sound, the M600s will definitely surprise you with their performance. This string pack clearly shows the advantages fluorocarbon strings have to offer. If you’re looking for the best concert ukulele strings that hold the tuning amazingly well, go for the M600s. What are the ukulele strings I should get for my tenor uke? The EJ65T tenor uke strings by D’Addario are carefully and precisely manufactured in order to provide you with the best playing experience. The whole process of making these is guided and inspired by D’Addario’s expert ukulele player Jake Shimabukuro, so you can definitely expect an improvement of your sound. As this is a pack of tenor ukulele strings, the low G string is wound, giving it that extra deep tone and sustain. The EJ65T tenor string pack offers unsurpassed intonation and a projecting acoustic tone. For just above $5, you can give your uke a vibrant and refreshed sound. Though these strings come at around double the price than the previous ones, they definitely offer a unique playing experience. The Aquila Lava series features gray-black colored strings which are inspired by volcanic rocks of Hawaii. Apart from looking rather uncommon, they also provide a very solid and vibrant tone. 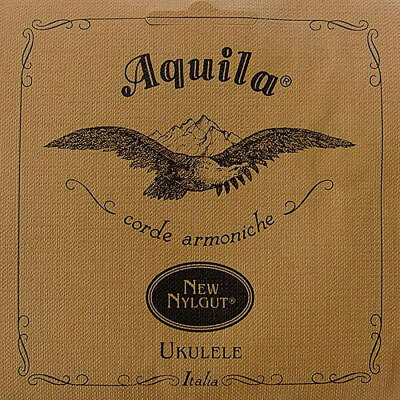 The material of choice is Aquila’s famous Supernylgut, which imitates the sound of far more expensive gut strings. The low G string is wound as well, but in this case in silver plated copper for added durability as well as sustain. If the slightly higher price point isn’t a problem for you, we would recommend the 115U Lava Series as the best ukulele strings for tenor. These are probably one of the least expensive string packs you’re going to find on the market that is still worth buying. For a price point just under $3, GHS managed to manufacture very nice strings for your tenor uke. Similar to the Lava Series by Aquila, these strings also feature a sleek black design. In this case, the C string is wound, and made of aluminum, and the rest are nylon strings. The sound these provide can be described as very soft and mellow, yet very articulate at the same time. If you’re looking for a way to always have new and fresh strings on your uke but don’t want to bust your budget, go for the H-T10 by GHS. Sure, they may not be the best tenor ukulele strings on the market, but for this low price, they will do the job just fine. And finally, a ukulele strings comparison for the largest one of the bunch, the good ol’ baritone uke. Made from clear fluorocarbon, the M630 strings are guaranteed to perform nicely for longer periods of time. Aluminum wrap wire alongside silver-plated copper is used to give your uke that needed punch in the low end. Though these strings are relatively cheap, they don’t squeak as much as other wound strings tend to. They can be a bit hard to tune at first, but once you’ve given them a proper stretch, they hold the tuning amazingly well. Definitely a budget-friendly yet worthy investment for your baritone uke. This is the same model from D’Addario we’ve mentioned when we were talking about the best strings for tenor ukes. However, an important difference is that these are optimized for Baritone ukes, especially for the standard DGBE tuning. The first two strings are D’Addario’s Pro-Arte extruded clear nylon strings, which give the uke a very crisp and balanced sound and pleasing highs. As the baritone ukulele needs a good boost in the low end, the 3rd and 4th strings feature a nylon core wrapped with a silver- plated copper wound. If you’re looking for the best baritone ukulele strings which are also pretty affordable, definitely check the EJ65B out. Similar to the concert uke strings coming from Aquila’s Red series, the 89U are a solid choice for any musician looking for an improvement in the sound of their uke. Aiming for optimal volume and comfortable playing experience, these strings offer a loud yet balanced and clear tone with amazing durability. These strings hold the tuning quite nicely, and after you’ve given them a proper stretch, their performance is more than solid. As they are meant for low-D tuning, both the D and G string are wound, making the ukulele sound more present and vibrant. Definitely check the 89U Baritone Ukulele Strings by Aquila, as they offer great quality for a reasonable price. As we’ve covered pretty much all the important factors to consider when buying uke strings, what’s the conclusion? What ukulele strings should I buy? Think about the sound you prefer, and what’s most important for you. Is it sound? Durability? Or maybe you just want a pack of strings that feel comfortable under your fingers after hours of playing. Whatever the case may be, going for any of the options we’ve recommended is definitely going to make a difference when compared to the stock strings on your uke that desperately need changing. We hope that you found this article useful, thanks for reading and see you next time! We hope that you have learned something new here and maybe even found your very own set of best ukulele strings. If you have any questions, feel free to ask away. Additionally, if you think this content is worthy of sharing, we’d be honored if you hit that Like button. After all, it is your feedback that fuels our passion for writing. Stay safe folks, and rock steady!